To get a consultant’s perspective, we asked David a few questions about the key benefits, common misconceptions, and traits to look for when considering an on-site clinic vendor. Here’s what he had to say. Q: How have on-site clinics traditionally worked? How have they changed? David: Clinics have a long and varied history, originally introduced to meet occupational needs, keeping employees working on the job, managing workplace injuries, and improving productivity. Over time, clinics evolved away from occupational health, into acute care and more recently into comprehensive primary care, wellness, and population health. Vera is the first direct-to-employer on-site clinic provider in the US to earn a Certificate of Validation by the Care Innovations™ Validation Institute. Certification from the Validation Institute backs Vera’s claims and supports the effectiveness of an on-site clinic. Q: What types of care are the best on-site clinics providing today? David: What makes sense for one population may not make sense for another, so the effectiveness of a clinic is dependent on the problem that the specific employer is trying to solve. Overall, whatever clinic model is chosen, it should be fully integrated into the employer and community healthcare ecosystem. Q: How do on-site clinics typically drive savings? David: Savings are typically driven by changing behavior. Changing behavior results in reduced injury, reduced health risks, and better management of chronic conditions. Editors Note: At Vera clinics, the majority of savings result from reduced utilization for what might generally be considered routine care. The biggest impact on healthcare costs comes from capturing and keeping more care in the on-site clinic, and making and closing high value referrals when necessary. Q: How do on-site clinics increase patient engagement/utilization of health benefits? How is this tied to the savings? David: The clinic provider becomes an expert in the employer’s health benefits. Supported with technology, staff training programs, and workflows/business rules, the provider and their care team can deliver navigational advocacy to ensure the patient gets to the right care, with the right provider, at the right time. Q: What common mistakes should employers avoid when investing in an on-site clinic? David: Employers should ensure there is a clear measurement strategy in place prior to opening the doors. The methodology should be agreed to with the chosen vendor partner, with fees at risk tied to performance guarantees. At Vera Whole Health, transparent methodology starts by sharing our validated results and proven outcomes. 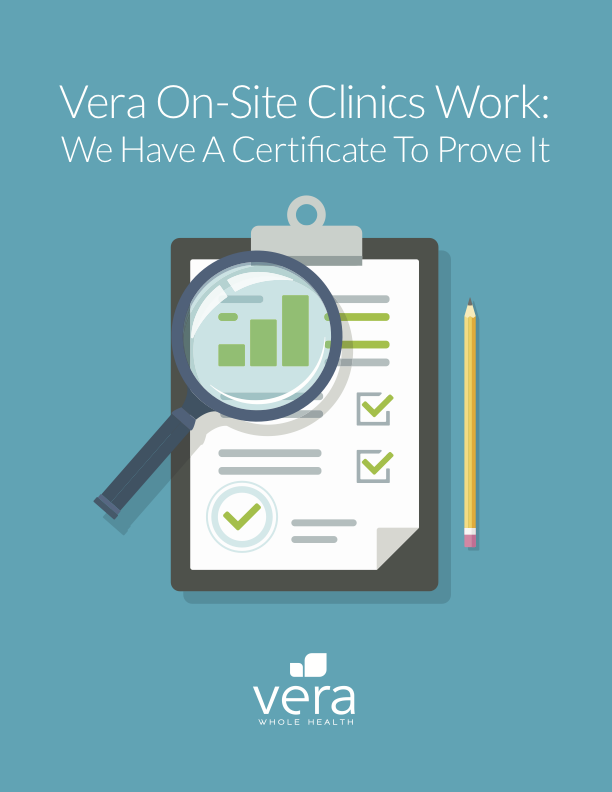 Want to learn how those results helped Vera become the first direct-to-employer on-site clinic provider in the US to earn certification from the Validation Institute? Check out our white paper: Validated Results and Proven Outcomes.